DP Alex Vendler, a long time collaborator whose credits include Melvin Goes To Dinner and the documentary Kurt and Courtney, took me out the other day to test his copter rig, which he’s recently been tuning and tweaking. Copters, the MōVI, and all 3 axis stabilizers need to be effectively tuned, using a computer or tablet, so that the motors which control the gimbal exert just the right amount of force in every axis. To the right is actually a photo of the graphical interface for tuning the MōVI. Vendler’s copter interface was very similar, and I believe they all have their roots in the same control board architecture. I’m out of my depth on that topic so I’ll let you google it if you’re interested. But the basic principle in tuning each axis is that if you apply too much motor torque then the stabilizer will vibrate, too little and the weight of the camera overpowers the gimbal and your footage is unstable. If you watch the video above, you may notice a tiny bit of shudder in the pan axis, which creeped in after he loosened the pan motor. It’s all part of the trial and error process. 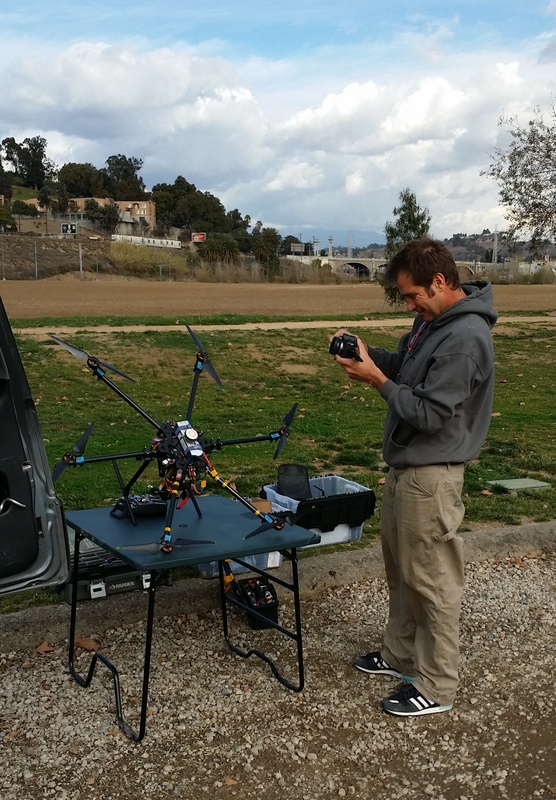 During our afternoon in the park, Vendler piloted the copter, and I operated pan, tilt and roll on the camera. We both use regular hobby style remote controls, which are standard in the stabilizer world. Anyone who plays video games will feel very at home using these remotes. The look around controls are essentially the same as any first person shooter you’ve ever played, except in this case the left joystick is for roll, whereas in videogames the left joystick is for directional movement. In MōVI world, the left joystick also controls the pan/tilt speed. Alex’s copter has a lot of nifty features, most notably is the video goggles you see me wearing. Normally an operator doing my job would have to hold a monitor and a remote control, which can get awkward unless you have a sort of rig which holds both, but the video goggles solve that problem and it’s so much more immersive. Even though I look like a total dorkenstein, it’s worth it cause it’s ah-MAZING! You can get in touch with Vendler through his website.